Leolux and Jan Armgardt have come a long way together and have been very successful. Devon is the crowning achievement of this collaboration. This sofa programme combines the design quality of Jan Armgardt with the craftsmanship that Leolux is known for. From an individual sofa or a chaise longue to a spacious modular set. Whatever you decide, Devon provides adjustment options with each version for glorious comfort. Thanks to beautiful artisanal details, you can instantly see that Devon is a proper Leolux, with its own specific look. Devon’s classy appearance is based on attention to details. The Devon programme contains a 2-seat, 2.5-seat and 3-seat sofa as well as a chaise longue, which can be added on to every set. Furthermore, 2.5-seat and 3-seat add-on elements (with 1 arm L/R) are available, and these will be combined with a Large or Medium chaise longue (with 1 arm L/R). A matching footstool is also available. 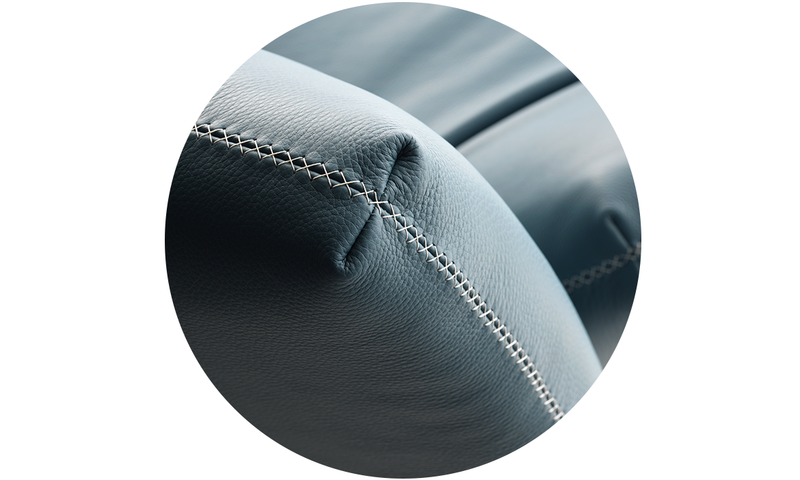 You can pick one type of upholstery: either fabric or leather. Devon wins people over with its wonderful comfort. It is soft and firm at the same time, with adjustable zones in the arms as well as the back. This is highly practical, making sitting as well as stretching out equally comfortable. Devon’s details make it a real eye-catcher; with sturdy aluminium legs, subtle ‘butterfly stitches’ on the corners and a beautiful decorative ‘Cross’ seam that frames the seat and back.